Last month was a HUGE month for DiPrima Photography! 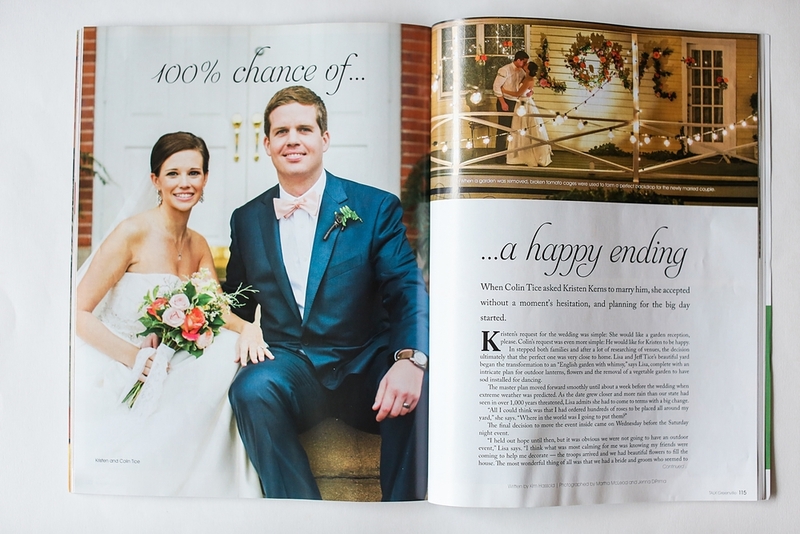 I had the honor of being published in the November issue of Greenville's TALK Magazine! This is the first time I've ever seen my work published in print, and it was an amazing blessing and encouragement! It was made even better by the fact that Colin and Kristen were SUCH a sweet and wonderful couple who are so worth celebrating! In fact, if you'll remember, Kristen and Colin's wedding took place the weekend of the hurricane in South Carolina. They had to move their outdoor reception indoors and we had to work around a hurricane and major wind and rain their whole wedding day. In spite of all of that, Colin and Kristen had great attitudes and were so full of joy on their wedding day and guess what? Their pictures of some of my favorite that I've ever taken! And they were published in a magazine! It just goes to show that if you are happy and choose not to worry and stress on your wedding day, everything will be alright! And what really, truly matters is that at the end of the day, you'll be married! Future brides: my encouragement to you is to choose JOY even when unexpected or difficult things happen on your wedding day (and it seems like something unexpected always happens every wedding day)! You can read the full story in TALK Magazine here. You can also see Kristen and Colin's wedding blog post here and Kristen's bridal portraits here.